The Incomparable Tommy Wonder filmed at the British Close-Up Magic Symposium . . . now a Download! 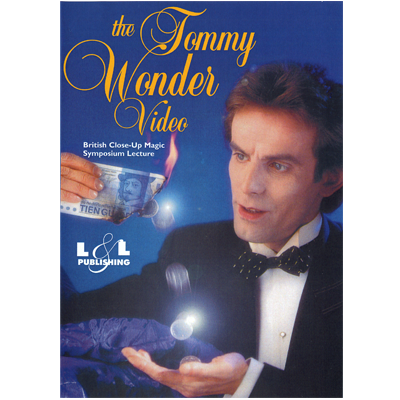 Tommy Wonder was one of the world's finest performers and magical thinkers, and this video captures some of his best close-up work when he presented his lecture at the British Close-Up Magic Symposium. Shot with two broadcast cameras. A must for any magician! Thanks to Paul Harris - Tommy's handling of the classic Paul Harris single torn and restored card in which the fourth piece appears to restore as well! The Shrinking Box - Two versions of the shrinking card case. Very practical construction, easy to use. Ambitious Card Routine - A clean and effective version leading to Card to Box, in which the signed card ends up folded inside a miniature hinged box on the table. 2-Second Card Fold - A detailed exposé of Tommy's lightning quick three-way card fold. Squeeze - the brilliant illusion of a full deck being visibly squeezed into a tiny card box. Deck Switch - Psychologically strong and easy to do. Tommy also provides advice on performing close-up magic. He shares his thoughts on timing, misdirection,presentation and a whole host of other aspects of the magical art - truly fascinating!